The automotive industry may be a dog now, but its “lean manufacturing” principles can be profitably harnessed by IT organizations to cut waste and create value, experts say. Lean Thinking : Banish Waste and Create Wealth in Your Corporation was the title and theme of a 1996 book by James P. Womack and Daniel T. Jones. In it, the authors relate how lean principles were implemented by captains of the auto industry — Henry Ford, Kiichiro Toyoda, Taiichi Ohno and others — when designing their production systems. And there’s no reason why an IT organization can’t extrapolate and benefit from the principles of lean manufacturing, according to Jimmy Fulton, country manager for CA Canada. By identifying and eliminating waste, he said, IT groups can avoid being constantly in fire-fighting mode. 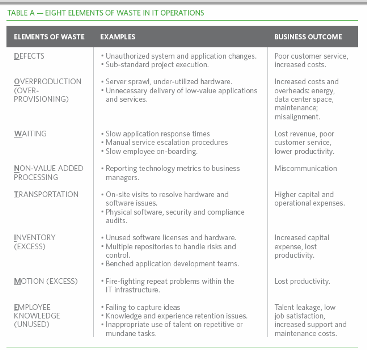 What are some ways IT operations can be streamlined and optimized so as to minimize waste? IT’s main role, Waterhouse said, is to develop and enhance business services that deliver value to the parent organization and its customers. While each of the eight elements of waste can be costly in themselves, combined they could severely cripple IT’s ability to support clients – both internal and external, he said. Application development and maintenance costs can gobble up more than 50 per cent of an IT budget, Fulton noted. This is still the case though many companies today are exploring low-cost offshore app development opportunities. Applying lean IT principles, he said, can boost productivity in this area by as much as 40 per cent, while enhancing quality and speed of execution. And this can be accomplished by looking for manufacturing process parallels in the app development cycle, the CA country manager said. For instance, several app development activities can be automated and linked to eliminate waste and streamline production flows. Similar thinking can be applied to IT operations, as these can be managed from a service life-cycle perspective, Fulton said. Lean manufacturing uses a technique called visual stream mapping. It involves analyzing the flow of materials and information that’s required to bring a product or service to the customer. The idea is to use production flow visualization as a means to identify and eliminate waste. IT professionals don’t use the term visual stream mapping, but they do analyze pictorial representations to understand technology components. The good news is they do not have to rely on hand illustrations, but can use applications such as Microsoft Visio diagrams or computer aided design (CAD) drawings to visualize and automate IT management functions. Technologies such as application dependency mapping and configuration management databases automatically discover and visualize technology, service relationships and differences, said Waterhouse. These tools can alert operators to unplanned downtimes and service disruptions, unauthorized process changes, or excess technology inventory that provides no value. Manufacturers design their processes to be more responsive to the changing customer needs. IT organizations can be just as agile when responding to strategic and tactical demands. Strategic demands include new projects and services that can fuel innovation and growth. Though in many firms these account for just 10 per cent of the IT budget, eliminating waste here is crucial as it prevents misaligned projects, and their costly consequences. Tactical demands are those placed on IT — such as help desk calls, provisioning and on-boarding of new employees. These consume 80 to 90 per cent of the IT budget. A catalogue could document and describe all services that IT provides, along with agreed upon service levels and costs. Such a portfolio could streamline service request processes. For instance a manager could initiate and coordinate a single process request for on-boarding a new employee. The process could include ordering a new PC, installing appropriate applications, setting up an e-mail account, and providing access rights. Provisioning new virtual machines based on capacity demands from the business still involves many disparate and labour-intensive activities. A better approach, says Waterhouse, is to monitor performance at a business service level and provision capacity when needed. For example, in an online retail shopping firm where high availability is critical, the system would monitor when performance falls below a business threshold and then automatically respond by providing new capacity. Capacity can be sent elsewhere when the system senses that demand has gone down.